Arthur D. Little’s Consumer Goods & Retail practice (CGR) operates globally across the entire ADL office network, with hubs in US, Japan, Germany, Sweden and UK. Together with our Consumer Health team the practice employs more than 60 specialists, plus an established network of over 50 regular associates. Over the last few decades Arthur D. Little has worked with most of the world’s leading CGR companies. We work regularly across the entire CGR value chain from ingredients and raw materials through to manufacture, packaging, distribution, retail and food service. We have broad experience across the consumer goods sector including agricultural commodities, food & beverage manufacturing, food ingredients, catering, consumer health, consumables, cosmetics, toiletries, textiles and fashion. Our services in CGR focus especially on: Incubating breakthrough innovation; New step-out business creation; Vision and future insights; Strategic planning; Finding new growth; Digital solutions and transformation; M&A support; and Performance Excellence, including R&D, Procurement, Marketing, Commercial and Quality management. Many established consumer good companies are struggling to find new growth in the light of trends such as changing consumer mindsets and preferences, millennials looking for personalization and authenticity, increased market share from multiple niche players, and stagnating demand in established markets. Delivering new growth outside the core business is at the top of the CEO agenda for most major players. 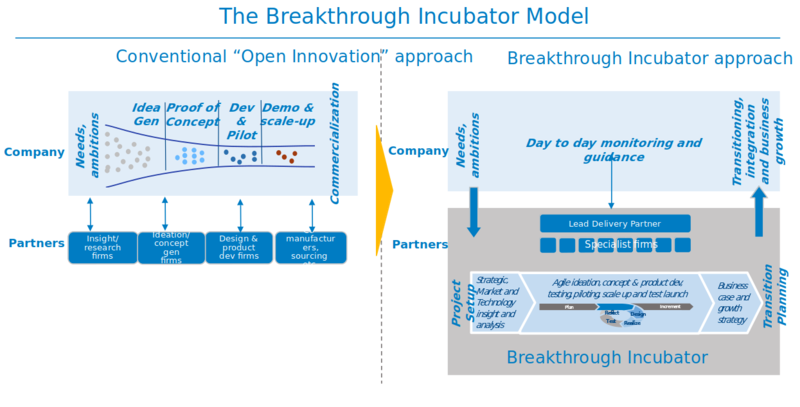 Our Breakthrough Incubator service is a unique and powerful approach for creating and delivering new step-out businesses. Using this approach Arthur D. Little acts as lead delivery partner in a fully externalized incubator process managing a network of other players, covering end-to-end innovation from ideation through to consumer insight, concept and product development, prototype manufacture, in-market testing, packaging development, brand development, operational and supply chain planning and launch. This external incubator approach offers huge benefits to our consumer goods clients, including lower costs, faster speed to market, elimination of brand constraints, removal of ‘not invented here’ barriers, agile development approach and full integration of consumer, technology, commercial, operational and strategic inputs. Designing a unique and differentiating company vision – a “Sense of purpose” - is becoming key for consumer goods companies in a fast-moving environment in which core products and services can no longer be assumed to be stable in the long-term. Our “Why Strategy” approach helps consumer goods companies to establish an enduring differentiated vision, and to make this a reality through every aspect of the company’s activities. Anticipating the future is critically important for a robust consumer goods strategy. Our forecasting and horizon scanning approaches use latest analytical tools together with expert insights, triangulating from a range of sources to identify key drivers and trends, modelling their impact on the consumer goods value chain, and prioritizing their strategic importance. In today’s business world traditional rigid multi-year strategic approaches are increasingly inadequate. Companies need to respond increasingly rapidly to disruptions and opportunities caused by major trends such as blurring of business boundaries, increasing expectations on speed to market, changing customer mindsets, rapid start-up growth and digitalization. Providing deep insight and foresight into consumer and customer trends. Establishing an agile culture that accepts complexity and expects constant change and realignment, including strategy and portfolio. The consumer good industry is being transformed by digital technology, including the shift to online, digital enablement of all channels, consumer personalization, big data analytics, connected products and devices, digital marketing, new manufacturing and supply chain technologies, new point of sale/point of consumption technologies and many others. Undertaking business-plan reviews (commercial due diligence and, in specific areas, technical due diligence) for vendors and acquirers.